Each year I count down the days until the Keukenhof Gardens open, just like a small child would count the days until Christmas. And each year I get super excited for my annual trip to this second-to-none tulip garden in the Netherlands. If there’s one attraction in the world that I want to visit over and over again, this is for sure Keukenhof. Keep reading this article and you will find 5 reasons to visit Keukenhof Gardens in the Netherlands and 1 reason not to, plus lots of handy tips for your trip to Keukenhof Gardens and the best things to do in Keukenhof! Before you go: The Keukenhof Gardens are open from 21 March till 19 May 2019. Tip: Are you visiting the Netherlands when Keukenhof is closed? Consider visiting the Gardens of Appeltern! 3.1 When is the best time to visit Keukenhof? 3.2 How to get to Keukenhof? 3.3 Are the tulip fields the same as Keukenhof? 3.4 How much time do I need in Keukenhof? 3.5 Why I don’t see the tulips from the old paintings in Keukenhof? 4 What to do in Keukenhof? Whether you will visit Keukenhof at the end of March, in April or in May, Keukenhof will be always different. Some of the tulips are blooming early in the season, some later. So, whenever you go, there will be different flowers in bloom. Is there a best time to visit Keukehof, then? My favourite time is when the trees are in blossom – somewhere in late April, but if it is an unusually warm spring it might happen that in early May most of the flowers are gone. Fun fact: On the website and the FB page of the park they are regularly publishing flowering reports, so you can check before you visit which tulips are in bloom. Rose, orange, purple, white or near-black, single, double or lily-flowered, fringed or parrot, you will find them all in Keukenhof! If you want to learn more about the various sorts of tulips, the history of the tulips, I would also recommend visiting the Tulip Museum in Amsterdam. Their website is also very educative. 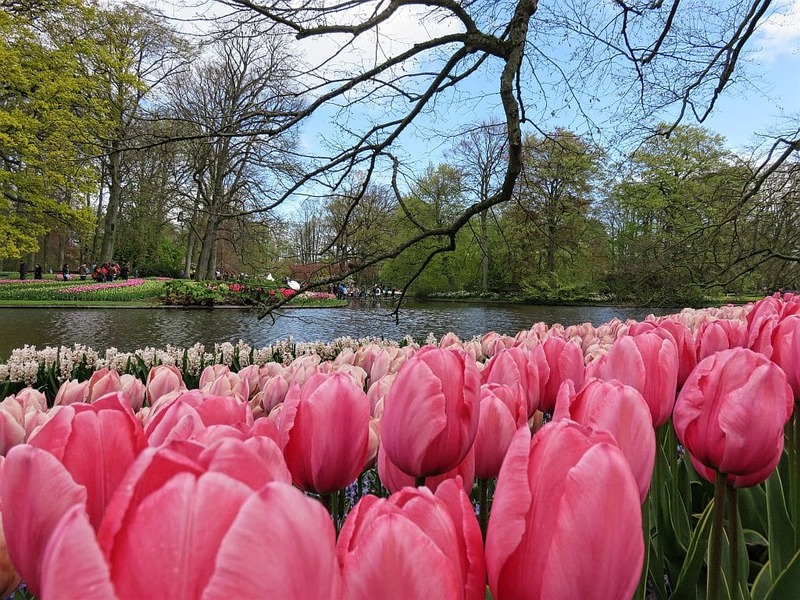 Fun Fact: For the 2019 edition they had planted more than 7 million bulbs and 800 different sorts of tulips in Keukenhof. Tulip bulbs are being planted in the autumn the previous year. Each year the park features a different theme and all exhibitions and activities revolve around it. There is a centerpiece – huge mosaic made of tens of thousands bulb flowers, depicting the theme. In 2018 the theme of Keukenhof was Romance, in 2017 – Dutch Design, in 2016 – The Golden Age, in 2015 – Van Gogh, in 2014 – Holland, in 2013 – UK, in 2012 – Poland, in 2011 – Germany, and in 2010 – Russia. In 2019 the theme is Flower Power, dedicated to the hippie movement – a subculture movement that emerged as a counterculture in the 60s and was popular throughout the 70s. Keukehof will be celebrating in 2019 its 70th anniversary and this is the connection with the Flower Power. Here’s a sneak preview of the 2019’s Flower Power mosaic during the planting in October 2018. I can’t wait to see the next year’s creations! When you mention the name Keukenhof everybody makes the association – oh, the famous tulip gardens in the Netherlands, but Keukenhof is not only tulips. It’s a showcase of the Dutch bulb growers and there are other bulb flowers featured in the gardens: daffodils, crocuses, hyacinths, lilies-of-the-valley, bluebells, snowdrops, irises. Did I miss something? Beside the park gardens, in the 3 of the 6 pavilions (Beatrix Pavilion, Oranje Nassau Pavilion and Willem-Alexander Pavilion) there are different flower shows – orchids, gerbera daisies, callas, amaryllises, and many more. Keukenhof is also not only about flowers. Each year there are showcased some awesome art installations. Every time I am amazed how seamlessly they blend with the flowers! Fun fact: In Keukenhof you can also find inspiration for your home and garden at the inspirational gardens. I can’t wait to see the 2019’s creations: Love and Peace Garden, or the Strawberry Fields Forever (for the Beatles maniacs), Happiness Garden, Flower Power Garden, Ibiza Garden, Forest Cabin Garden, or The Green Machine Garden. Tulips originate from Asia and became popular in the Ottoman Empire (today’s Turkey) in the 16th century. The same century the tulip was also introduced in Europe and became a total hit. Things got really out of control in the beginning of the 17th century (the so-called Dutch Golden Age) when the prices of the precious bulbs skyrocketed after the introduction of a speculative futures market. A single bulb would cost more than a house! After the enormous peak in 1636 the market collapsed at once somewhere in February 1637 and overnight many people lost everything. (Just a subtle side note here – funny how history repeats itself, isn’t it?) This period of the Dutch history is known as Tulip Mania. Visit the exhibition in Juliana Pavilion to learn all about it. Fun fact: The Tulip Mania was the first economic bubble in history. Wait, why do I, despite being an advocate of visiting less touristy places, am recommending you and telling you that Keukenhof is worth the visit? Isn’t it just another tourist trap, with more than a million tourists visiting the gardens in 50 days, which makes like 20,000 visitors per day on the average. Do you want to be with some other 20,000 people at the same time on an area of 32 ha? If you DO NOT love flowers, better DO NOT visit Keukenhof, you would hate it! Tip: If you are not into flowers, then maybe you can consider another day trip from Amsterdam. Are you already inspired to visit one of the most spectacular gardens in the world? Here are some tips to make your visit more enjoyable. DISCLOSURE: This post contains affiliate links. If you make a purchase via one of these links, I may earn a small commission at no extra cost for you. This is not a sponsored post. I pay my tickets each time I visit Keukenhof. Everybody is asking the question when to visit Keukenhof, but I will tell you when you should not visit it. When planning your visit to Keukenhof avoid at any cost the national holidays or the weekends. The best time is to go on a weekday. Try to be there early in the morning when the park opens. Thus you will skip the crowds and as a bonus you will have the morning light which is great for taking pictures. 27 April (Friday) – King’s Day – Not many Dutch will be visiting Keukenhof on this day as they will be dressed in orange celebrating the King’s birthday but travelling by public transport on this day can be a nightmare. Tip: Remember Keukenhof is open only a limited time per year. In 2019 you can visit the park from 21 March till 19 May. Most people think the Keukenhof Gardens are in Amsterdam, but they are actually located near Lisse, a small town in the Dutch province of South Holland. This region is also called Dune and Bulb Region (Duin- en Bollenstreek in Dutch). It’s very easy to get to Keukenhof either by public transport or by car. If you have a layover at Schiphol, there’s an express bus that will take you to Keukenhof and back. If you have luggage, there are also lockers at Keukenhof where you can leave it. Alternatively, you can book a tour where the entrance ticket is included in the price together with the transfer. There are also different combination tickets for transportation and entrance to the park. Detailed information about the combi tickets can be found on the official website of Keukenhof. My advice would be to use public transport, especially if you are visiting at the weekend, in order to avoid the traffic jams. Tip: Stay overnight in one of the places around Keukenhof, and take the bus the next day to the gardens. Are the tulip fields the same as Keukenhof? No. The experience is totally different. Not that the fields aren’t beautiful or not worth seeing, but they are just simple coloured blocks of one and the same type of tulip all the way (reminding of Mondrian paintings), compared to Keukenhof where the tulips and other spring bulb flowers are arranged in gardens and designs, mixed to perfections, creating intricate forms and patterns. And all this beautifully landscaped with water features, rocks, trees, and small hills. There’re combined tours for Keukenhof and the fields, or you can rent a bike at Keukenhof and make the tour yourself. Tip: If you want to visit the fields, the best time is in April, as late March they won’t be blooming and in May the tulips will be already headed. Before you go, check Flower Radar. Shall I buy bulbs at Keukenhof? Nope. At least don’t buy spring flower bulbs as they won’t blossom. Spring flower bulbs are harvested in the summer and need to be planted in the autumn. So, if you buy tulip bulbs at Keukenhof (I know, it makes a great souvenir, but still…), it means they have been harvested the summer before and you will have to wait until October/November to plant them, so the chance is that by that time the bulbs will be already dead. However, you can order spring flower bulbs with some of the bulb growers in the neighbourhood and they will ship them to you in the autumn. If you come from a country where you don’t have four seasons, do not buy tulip bulbs at all. The bulbs need a winter and temperatures below 0°C (32°F). To learn everything about the tulips and the bulbs, you can sign up for a tour to a bulb farm. Tip: If you are visiting the Netherlands in the autumn you can buy bulbs. Make sure to check whether you can bring bulbs in your country. At Schiphol they are selling bulbs with a customs friendly sticker. Do not forget to declare them at the customs! How much time do I need in Keukenhof? This is a tough one – it depends on how many pictures you will be taking and how many times you will be stopping at each tulip sort to enjoy it. The park is quite large (32 ha), so you should plan at least half a day for visiting Keukenhof Gardens. The best is to stay a whole day – thus you won’t rush and you will be able to see the exhibitions in the pavilions as well. For sure you won’t be bored in Keukenhof! If you have seen all of it, you can also take a boat tour through the fields near Keukenhof, which departs at the windmill in the park. Tip: Make sure you take a map of the gardens at the entrance or you can alternatively download it from the official website of Keukenhof Gardens in pdf format. Why I don’t see the tulips from the old paintings in Keukenhof? On most of the paintings of the Old Dutch Masters there are those beautiful tulips with intricate patterns and mixture of two or more colours. Well, these are the Rembrandt sort of tulips and they are actually infected with a virus that causes the solid colour to break and create those unusual effects. Most of those tulip sorts have already disappeared as after being infected with the virus they eventually die afterwards. Nowadays, there are broken tulips look-alikes that are actually due to hybridization rather than to the broken virus. If you want to learn more about the tulip breaking virus, you can read this article. Tip: If you are interested in historical tulips, you can visit the Hortus Bulborum in Limmen. It’s open from 6 April till 16 May. Professional photographer or just an amateur, Keukenhof is perfect for taking great pictures, especially for macro photography. Think of all the colours and forms, and the bees that love the tulip petals! If you are newly weds, you can also choose to take your wedding pictures there. At least a lot of Asians do this. At Keukenhof you can also make a boat trip through the fields with one of the so-called ‘whisper’ boats – you will see the tulip fields from a different angle – as if you are moving through a forest of tulips. The ‘whisper’ boats depart at the windmill in the park. After you’ve learned that the tulip fields are different form the Keukenhof gardens, you can also take a walk in the fields. As they are accessible via the parking of Keukenhof, you’d better do this after your visit in the garden, as the tickets do not support multi entrance. At Keukenhof you can rent a bike and explore the surrounding areas with the tulip fields and even go to the sea and the dunes! You will get also a map with various biking routes – from 1 up to 25 km. Each there are organized special events and festival at Keukenhof. In 2019 the choice is amazing with an emphasize on Dutch heritage and of course on Flow Power – the theme for this year. Mellow Yellow – 21-22 April, 11:00 – 15:00 – Keukenhof will celebrate Easter in yellow with a gigantic Easter eggs and daffodil garlands. Oh, and the Easter Bunny will be there! During the flower shows in the pavilions you can take part in workshops to learn to make beautiful flower arrangements. I bet you haven’t heard about the castle. Yep! There’s a castle just outside of Keukenhof Gardens, which you can visit free of charge. The Castle itself can be visited only with a tour, which at this moment is on hold due to ongoing reconstruction works, but the gardens and the park are accessible. The best is to visit the castle after your visit to the Keukenhof Gardens, as the tickets for the tulips park aren’t multi entry. If you want to see something truly amazing then the Flower Parade should be on you bucket list. A dozen of floats decorated with the most stunning figures made out of bulb flowers, will parade through the streets in the so-called Bollenstreek (Bulb region) and will pass by Keukenhof. But be warned – this is perhaps the busiest day in Keukenhof and the area! For the latest information, check out the website of the parade. In 2019 the Flower Parade (Bloemencorso) will be held on 13 April (Saturday) and can be seen at Keukenhof around 15:30 – 16:30. The theme of the 2019’s edition of the parade is “Changing the World”. If you are visiting Keukenhof with kids, they won’t be bored either. There’s a lovely small animal farm, where they can pet animals. They can do a treasure hunt in the park or venture into the maze. The maze is fun though not only for kids! Tip: Make sure you read the comments to this post as there are some specific tips about visiting Keukenhof based on questions by readers. Are you staying longer in the Netherlands and are running out of ideas which places to visit beside Amsterdam? Perhaps you can consider The Biesbosch? It is a lovely natural reserve at the wetlands in North Brabant. If you love cities, then I will recommend you Den Bosch (‘s-Hertogenbosch), or if you are into small charming places, then you should not miss Heusden. Have you been to Keukenhof? Or shall I ask how many times have you been to the gardens? Have you visited Keukenhof more than once or do you have other tips, help the readers by leaving a comment below! I am from India, It is very nice Article, and giving detailed and useful information about Keukenhof. For the last 43 years I was wanted to see this place. The desire to visit my “Dream Destination” started in Year 1976, when I first saw its colored slides taken by My Father, during his visit to “Netherlands” in year 1976. This year i.e April 2019 I will be there to see it from my eyes. I am early riser, I would like to know, how much early I should reach to avoid the rush and be the first ones to enter. Should we reach at 8 am ? Thank you for your kind words! It’s so exciting when a dream comes true! I really hope you will had good weather in order to enjoy Keukenhof Gardens the most. Indeed, if you arrive there when the park opens (@8:00 am) there won’t be too many people. The crowds are the biggest between 11:00 and 16:00. The earliest I have been at the park is around 9:00 am and it was pretty OK. The theme this year is Flower Power dedicated to the 70s and the 70th anniversary of the park, so it will have a kind of symbolic meaning since your father visited the park the 70s. Greetings from Germany. Great Blog and Wealth of Insights about Keukenhof. I have planned to visit this friday, the 4th May (will be there by 10.30 am or so) with my family. As we plan to cover other parts of Netherlands as well, we have luggage ( 2 Hand Baggage) to carry. I was not clear as to will there be enough free lockers at Keukenhof to keep the luggage or should i keep them at Schiphol airport Baggage storage itself (on a safer side). What do you suggest? Also, need your thoughts on the tickets availability pattern for the whisper boat rides… Are they usually full, with a long wait time or relatively free…. Should we go first for this ride before exploring the park, …. Regarding the luggage: If you are travelling from Schiphol to Keukenhof and back, I would advise you to leave the luggage at Schiphol, thus you won’t need to carry it with you on the bus. But if you plan to head from Keukenhof directly to somewhere else, then you can use the lockers at Keukenhof. There will be enough free lockers at Keukenhof. As for the whisper boats, I would advise you to first go at their kiosk (at the Windmill Square) and check the availability for the various departure times – thus you can buy the tickets you want for the time slot that suits you the best. Afterwards you can explore the park without worrying whether there wil be places left. As I don’t know how much time you are planning to spend in Keukenhof, I would advise you to skip the boats, if you are spending 5 or less hours there. The trip takes 45 min and with all the time you need to buy the tickets, etc., it will cost you about 2 hours in total. I hope my answers are helpful. Let me know if I need to further elaborate on something. Have a lot of fun in the Netherlands and enjoy your time in this amazing tulip garden! hi there! your blog is phenomenal – thanks for all the info and tips. I am headed to AMS on Friday May 18th which is unfortunately after Keukenhof closes. Will there be any tulips at all to see? Greeting from NYC! i am taking my mom and aunt for early Mother’s day gift to AMS especially to see the tulips. We arrive May 6th which falls on Sunday. We plan to visit Keukenhof garden on Monday. However, i am thinking of visiting a tulip field on the day we arrive. Looks like all the helicopter tours are suspended from May 7th so i am assuming that’s when they cut the flowers. If there a best way to go to these fields via public transportation? None of us drive and my mom cannot ride a bike. Thank you so much in advance. Thank you for reading my post! I am sure you will love Keukenhof! Good choice that you are going on Monday. The spring holidays in the Netherlands just finish on May 6, so Monday 7 will not be that busy. As for the fields, I really hope that there will be still tulips after/on May 6. When they gonna cut them, it all depends on the weather. We had a very cold spring this year and the tulips were late, but then it was so hot last week, that it kind of compensated it. If you decide to go to the fields, than I would recommend you to take the train from Amsterdam to Hillegom (1 change). Then you can walk around there. (See the map of the Flowerradar below – there you can see where the fields are). You can check the train schedule here: https://9292.nl/en. I will advise you as well to check the status of the fields before you go. You can do this on this website: http://www.flowerradar.com/ or on this FB page: https://www.facebook.com/Bollenstreek.nl. I really hope there will be tulips at the fields, but if there aren’t, you won’t be disappointed – Keukenhof will compensate it all – it’s soooo beautiful! Wishing you great time in Amsterdam and let me know how it went with fields! If you have other questions, just let me know. OMG! Thank you so much for the detailed information, Daniela! Yes, will be praying that we will get to see a tulip field during our visit. I will be checking the flowerradar website you shared. Definitely, will keep you posted. Again thank you so much this is so helpful. i wasn’t sure how to go about and what checking out Bollenstreek. Thank you once again for your inquiry, Teri! Have a lot of fun in the Netherlands and enjoy your stay! Thank you! Oh, next week Keukenhof will be just perfect! We are having a not so warm spring this year, so the tulips are kind of shy this season. I am sure you will love it there! I am so happy you loved it and glad that my post played the decisive role! ow! Really beautiful. I had not heard of Keukenhof. It looks amazing! I’ve seen pictures of tulips in Keukenhof since I was little and since that I told myself that one day I will have to go there. Sadly, I haven’t make it until today. I believe I will make it though. Btw, all the pictures are super beautiful! I love flowers, so I need to add this to my bucketlist. The variety of tulips is really impressive. I have never had a green thumb so I think it makes me appreciate gardens more. Thank you! I haven’t cropped anybody 🙂 I’ve mostly visited on a week day and when taking pictures, I always wait until there aren’t many people. In the morning until 10 o’clock and in the afternoon after 4 there aren’t many people, as well. The blue carpet is one of the designs they recreate each year. When you see it there, it pretty amazing. Good idea waiting for people to move on. It makes your piccies seem really peaceful. Awesome pictures with tips and details. I didn’t knew that boat rides are also available. Good information. I love tulips, probably because I can’t recognise other flowers. 🙂 This place looks surreal. Dreamy! I am not usually a flower kind of lady but after reading this post I think I need to visit Keukenhof. I want all the flowers. How beautiful! I’ve always wanted to see the tulip fields but I hadn’t realised until now that Keukenhof was a better option- thanks for the tips! Well this is absolutely amazing! I haven’t been to Amsterdam yet, but when I do go, I will definitely have to see this. The tulips are so beautiful! Thank you for the tip! Wow, I have never heard of this festival! I’ve never been to a flower festival. Beautiful photos! Every summer I say, oh yeah this fall I am going to plant tulips, but alas I have yet to do it. I would love to visit – I love flowers and the thought of all those tulips is magical! A very comprehensive guide! We aren’t in Europe at the moment but will definitely save this for when we do get the chance to go! Hopefully you will make it one day there! I have always wanted to go to a Tulip garden. Tulips are one of my favorite flowers and I never researched where to go to see the flowers in bloom. But this post has put Tulip Garden back on my radar and I might have to make a special trip to The Netherlands this year to see all of that beauty. Thanks for the tips about when to go and when not to. Great post! You won’t regret visiting Keukenhof! It is such a delight for the eyes! I can’t wait. I have already told my partner about it and we are hoping to make it this year! I’ve never been to Keukenhof, but I’m a huge flower lover, so this looks like it’s right up my street! I’d love to take the bike ride that you suggested, along with learning how to do flower arrangements. Sounds super fun! Yep, the bike ride is super fun! They even have tandem bikes, if you’re there with a friend!